Red light cameras are put in place as safety devices, but increasingly, the public sees them as money-making scams that can actually make roads less safe. They are losing ground with the local government, too, as Mayor Lovely Warren announced Thursday that the City will soon be terminating its red light camera program. “All programs have a beginning and an end,” Warren said. 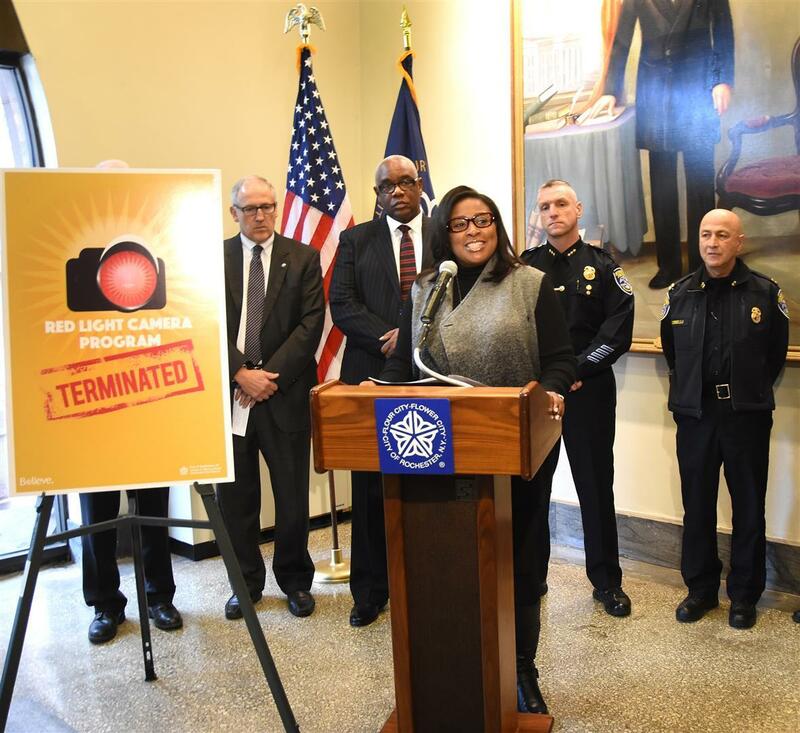 Mayor Lovely Warren announces the termination of the city's red light camera program. Upon her own review of a study conducted by an independent traffic consultant contracted by the City, Warren said she was troubled by the fact that there were more total red light violations in zip codes with the city’s highest rates of poverty. This led to her decision to call for an end to the program. “The results were inconclusive at best. Some of the intersections with cameras did see a decrease in red light violations, others saw an increase, and some stayed the same,” the Mayor said. Warren said the red light program was “wildly unpopular,” however she added that running a red light is a very dangerous offense which puts both our citizens and visitors at risk. Many Americans have had the same perplexing experience. They get a letter in the mail; it has a photo of their car, running a red light. They don’t remember it happening and the city that issued the ticket is not the city in which the incident occurred. And yet, it says they have to pay. The same has occurred in Rochester; the red light camera program has stirred much controversy since its official launch in 2011. Each ticket carries a $50 fine, earning the City between $800,000 and $1 million per year from the proceeds. Last year, local groups protested in support of the working poor, saying that many who received tickets didn’t believe they were in the wrong. Rochester’s red light camera program will end at midnight on December 31. This means cameras at all 32 intersections in the city will be taken down in January. Tickets accrued between now and then will need to be paid.